A Cooperative Approach Toward Understanding Democracy: A Foundation for Ending Extremism and Preventing Conflict. Available from Amazon.com, Barnes and Noble.com, Books-a-Million, or contact us. Islam and Democracy is a timely myth-breaker for an era where Islam is often mis-perceived as intolerant, extreme and inherently undemocratic while chauvenistic assertions of the superiority of Western democracy are made too often and too unreflexively by European and North-American ideologues. The author of this book J.E. 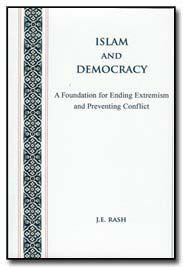 Rash is both an experienced Muslim religious leader and educator as well as a committed democratic thinker, giving this work a depth of understanding and commitment seldom found in other texts dealing with these issues. For those interested in obtaining tools for dealing with one of the seeming conundrums of today’s world, Rash’s book provides invaluable insights through a constructive approach that builds bridges of understanding. He provides a conceptual framework with which the shared ideals of both democracy and Islam (to which we may add Christianity and Judaism) can be realized within fallible human societies. It is an enlightening process to compare statements made by the founders of American democracy in the Eighteenth century with references to the Qu’ran, sunnah, and the long tradition of Islamic scholarly literature–including today’s–which Rash brings together in one collection of essays.